What Is Hard Waxing And Hard Wax Beans? Would you believe me if I tell you that painless waxing is already possible? Thanks to hard wax beans, painless waxing is no longer a far-fetched idea. They’re easy to use and grab even the shorter hair to leave a hairless, smooth skin. Lots of people have many questions about buying the best hard wax beans and how to use them right. In this article, we’ll do all the legwork for you and review the most popular hard wax beans on the market today. All of these products are ideal for all body parts including face, legs, and underarms. The following hard wax beans are great on their own. They’re great for sensitive parts of the body and suitable to all skin types. However, not all are made equal so we compare the best 10 hard wax beans for their quality and results. So what makes hard wax beans special? It’s their almost painless waxing experience. Compared to soft wax, hard wax beans don’t leave a sticky residue so cleanup is much easier. The hair is also easier to pull out as hair follicles open up with the heat. Convinced now? Here are your 10 options compared and reviewed below. 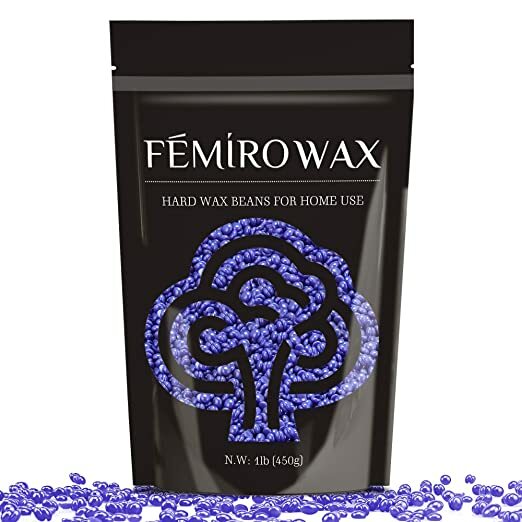 Femiro hard wax beans are made to remove stubborn hair in whatever texture. They’re great for all body parts including the sensitive areas, like your bikini line, armpit, and face. No more spending more time and money in salons to get a Brazilian Wax because Femiro allows you to wax at home anytime. Made of natural ingredients, like natural pine rosin and beeswax, to remain elastic even at a low temperature. 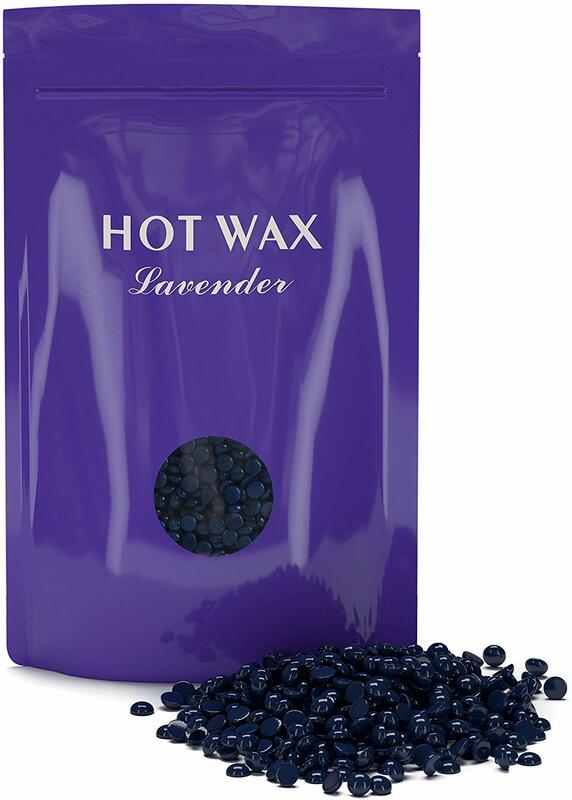 Packed with 1 lb of lavender wax beads to get you covered for several months. Femiro firmly grips each strand and removes hair from the roots making it effective in removing hair without giving any side effects. The only downside is, it’s slightly stringy but it gets the job done. Purean promises to give smooth and hair-free results up to four weeks. This is twice as long as shaving. It removes unwanted hair from all parts of the body including face, eyebrows, and legs. The hot melted wax sticks to the hair and dries up like a thin sheet. It’s easy to yank and suitable for sensitive areas, like the bikini area, face, and upper lip. It offers a 100% satisfaction guarantee which means you have nothing lose. Like other hard wax beans on this list, Purean doesn’t need strips to remove hair. All you need to do is to melt the beans and convert it into a pliable texture. The downside is it comes in a small package so you have to buy it frequently. 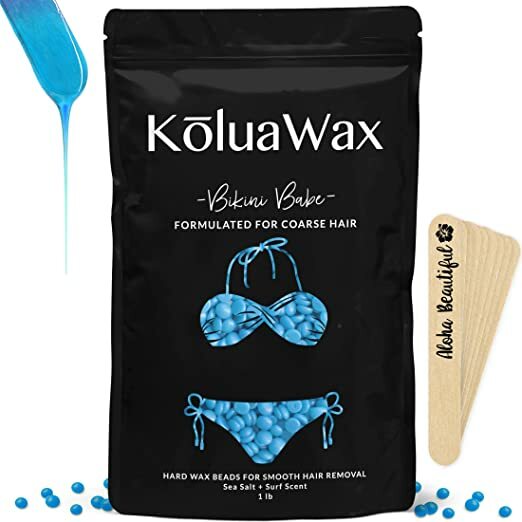 The blue Bikini Babe is made with a luxury formula of natural Brazilian carnauba wax. Its created with the best ingredients to wax off even the most stubborn hair. The tiny blue beads are ideal for all parts of the body including bikini, underarm, and chest. It comes with a relaxing fragrance of sea salt and ocean breeze. Includes 10 spatulas and a free guide to know the tips and tricks of waxing. The beads melt fast and highly pliable for easy removal. Not happy with the results, ask for a full refund. KoluaWax offers a 60-day money back guarantee. It’s important to note though that the Bikini Babe takes longer to dry. Make sure that the wax is fully dried before you yank it off or else it will leave a messy string of wax behind. The improved formula includes only safe and simple natural ingredients such as coconut oil, rosin, beeswax, and paraffin. It pulls off unwanted hair by the roots and grabs the hair without any pain. It’s specially made for sensitive skin. The resin contains anti-inflammatory and soothing benefits to avoid irritation. Lansley has a low-temperature melting point which means that it will keep the consistency of the wax longer even when temperature drops. It also won’t burn your skin. Don’t worry if the wax came melted in your home because Lansley will offer a replacement. They even give a full refund within 30 days before purchase if you’re not satisfied with the product. The only drawback is the consistency of the wax when melted. It tends to be so stringy. You also need to repeat the waxing process on some hairy areas. Yovanpour features a versatile formula. It can remove unsightly hair from your whole body including bikini, arms, and face. It’s effective in dealing with thick hair, yet gentle on sensitive skin. The hard wax beads are made with natural Brazilian carnauba wax. They give a strong grip on the hair and remove them with just one peeling stroke. Don’t like the wax? Get your money back within 30 days from purchase without any questions asked. The downside is the wax is much thinner which means, it may leave a bruise if you pull it off. For a better experience, apply a thick layer of wax on the skin. Cirepil Blue is developed by Perron Rigot which is one of the leading experts in the world of waxing since 1936. The French manufacturer has patented over 20 depilatory waxes, including the first stripless wax and hypoallergenic wax. Their long years of experience in developing waxing products really manifested in the Ceripel blue wax beans. 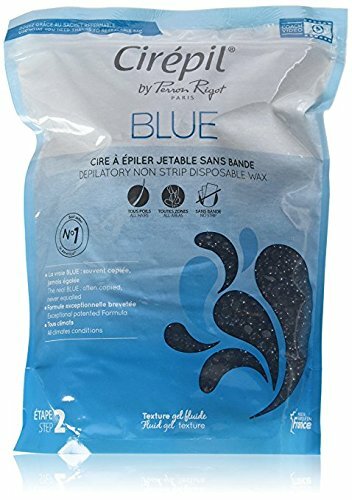 This 400 grams of Cirepil refill bag can be used to any wax warmer. Cirepil uses a special patented polymer formula that shrink-wraps hair for easy removal of hair. Excellent for all parts of the body including all sensitive areas, like the bikini line. Features a vibrant blue color and fragrance-free formula. This wax offers a supple gel texture that’s very simple to work with. Cleanup is easy with any wax pot cleaner or other types of solvent. 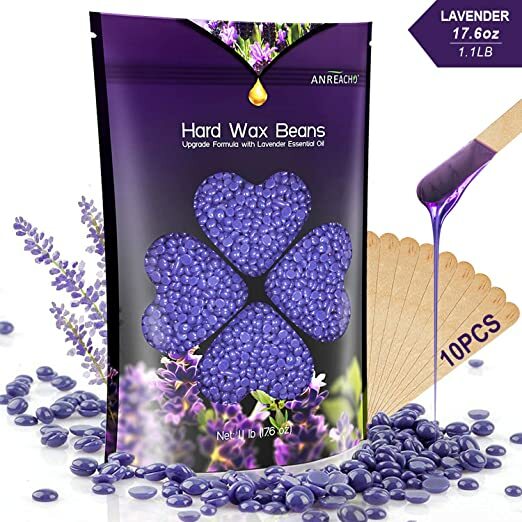 The hard wax beans are packed in a resealable bag that’s easy to store and use. However, the smell is difficult to get used to. It’s like the normal smell of melting wax. If you have really sensitive skin, the wax may cause redness temporarily. Don’t worry because a cooling product, like aloe vera gel, should diminish the redness. 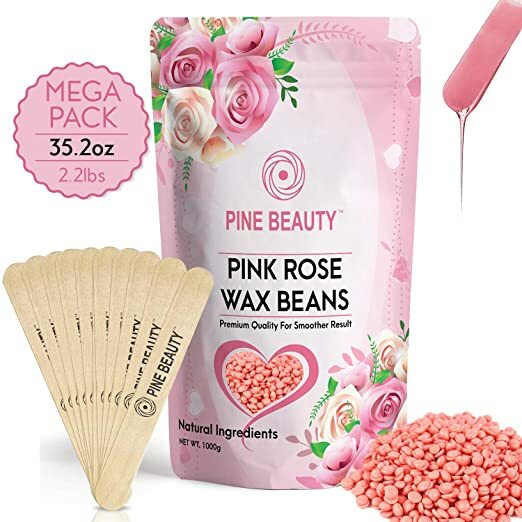 Another painless hair removal product that you should put on your list is the Pink Rose Wax Beans from Pine Beauty Co. This includes 10 spatulas to make the application of the wax easier. It comes in a 1,000- gram refill bag which can last you for several months of application. The Pink Rose wax beans are made to remove the stubborn hair that grows on the arms and legs. Pink Rose is made of natural ingredients to prevent your skin from any allergies and irritations. It doesn’t contain any chemicals and toxins making it safe even for sensitive. It boasts a gentle floral scent that leaves your skin smelling good for long. Using this wax helps to make the hair grow fine and soft. The Pink Rose is FDA-approved to meet the quality standards of hard wax beans. The downside is the advertised weight is different from the actual weight. As advertised, the product is 2.2 lbs worth but it’s actually less in reality. The melting point is a bit high for face and bikini area so, they’re not good for delicate areas. ​Wax Necessities is another reliable hard wax brand on the market today. 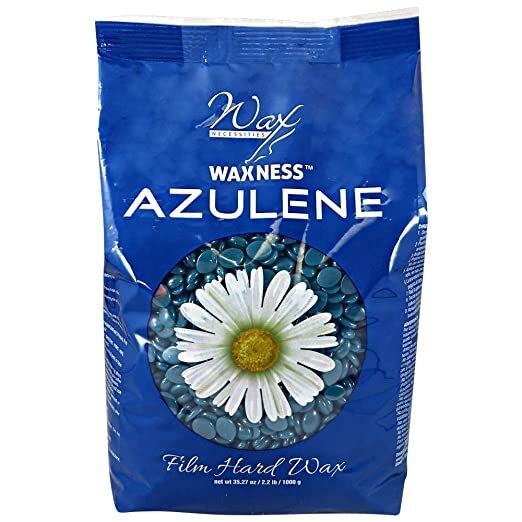 Their bestseller is the Waxness Azulene hard wax beans. The Azulene is perfect for removing hair from the armpit and bikini area. It offers a short period of hardening for a faster depilation procedure. The downside is that the the smell is a bit unpleasant but you can get used to it in time. It would also have been better if the bag is resealable so you can store and use it easily. If you want long-lasting hairless results, the Anreacho Hard Wax Beans is a good option. Anreacho removes hair by the roots to give you a hairless result of up to two months. It comes with an additional 10 wooden spatulas to help you apply the melted wax with so much ease. The upgraded formula includes lavender essential oil to soothe the skin and give a nice refreshing scent. It’s proven to remove at least 90% of hair at one go. It’s made of natural wax ingredients to protect your skin and health. It takes less than 10 minutes to melt in a wax warmer. No strips or cellophane needed. FDA-approved and satisfaction guaranteed to be effective to remove unwanted hair from all parts of the body. However, Anreacho isn’t recommended for sensitive skin. You need to do a patch test to check whether you’re allergic to the wax or not. The wax may also create a horrible mess so be careful. LeChic offers one of the biggest refill bags on the market today. One refill bag contains 1 kilogram of hard wax beans and available at a lower price. You can enjoy a salon-grade result at the convenience of your home for a long time. The hard wax beans are universal, which means that they can use used in any brand of wax warmer. 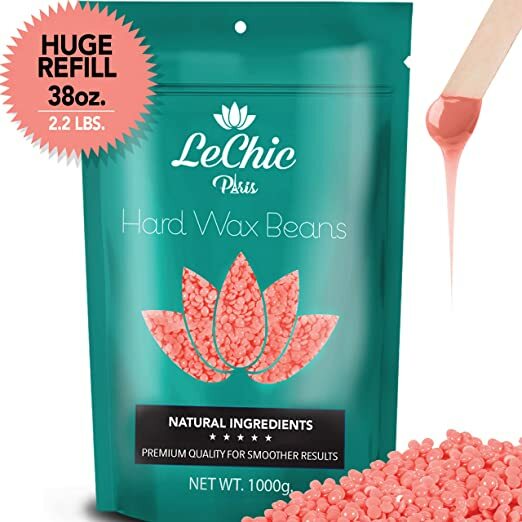 Like all the other hard wax beans on the list, LeChic doesn’t need strips to remove hair. Simply let the melted wax dry on your skin and peel away. LeChic offers a money back guarantee. If you’re not happy with the results, ask for a full refund. It’s great for sensitive skin. The rose beans are suitable to your face, underarms, and bikini areas. It’s made of natural ingredients and not tested on animals. However, the hair adhesion of this product is a bit poor. It can’t pick up hair like the other products above. It also dries a bit slow so you need a lot of patience when using this product. Hard waxing is a painless method of removing unwanted hair from the body and face. It uses a wax heater to melt the hard wax beans. When the beans melted into some sort of liquid form, it can be applied to the areas you wish to remove hair. 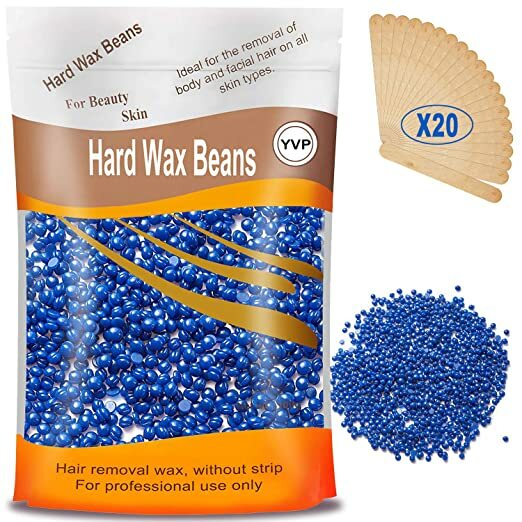 Hard wax beans are small pellets used in hard waxing hair removal method. They come in different colors and scents, like green tea and lavender. They’re gentle on the skin even on sensitive areas, like your bikini area, upper lip, and underarms. Rosin or the natural form of resin is the basic ingredient of these wax beans. The formula can also include other skin-friendly ingredients, such as cocoa butter, aloe, and lavender. These ingredients help prevent your skin from irritation and allergies. Hard waxing is a more effective way of removing unwanted hair than shaving. The results can last up to three weeks without the horrible itching. The procedure is very easy because there’s no need to use a strip, cloth, or pre-wax oil. Compared to soft wax, hard waxing is less painful. It can be used in small areas, like underarms, upper lip, and eyebrows. It doesn’t leave any sticky remnants, making it very easy to clean up. Hard wax grabs the hair very strongly, reducing the necessity to wax on the same part twice. Hair is easier to pull out because the heat opens up the pores and the hair follicles. However, it can be expensive but the long-lasting results are to die for. Using the wax warmer, heat the hard wax beans until they melt. Using the wooden spatula, apply a thick layer of melted beans onto your skin. Go in the opposite direction of hair growth. Let the wax cool for a few minutes. Once cooled, hold the skin taut and remove the dry layer of wax from the skin. Again, go against the growth of hair. Follow through with a good moisturizer to hydrate the skin. Just a tip : Tap the wax a few times before pulling off the wax. This will check if the wax has set and ready to be stripped off. Follow all the steps above and you’ll surely enjoy smooth and glowing skin for a few weeks. Ingredients: The best hard wax beans are made of natural ingredients. They should not contain any chemicals, fillers, and preservatives. If you found an ingredient that’s hard to read on the label, then you should think twice. Coverage: It would be ideal if the hard wax beans can be used all throughout the body including face, bikini line, and underarms. It should suit all skin types and hair types. 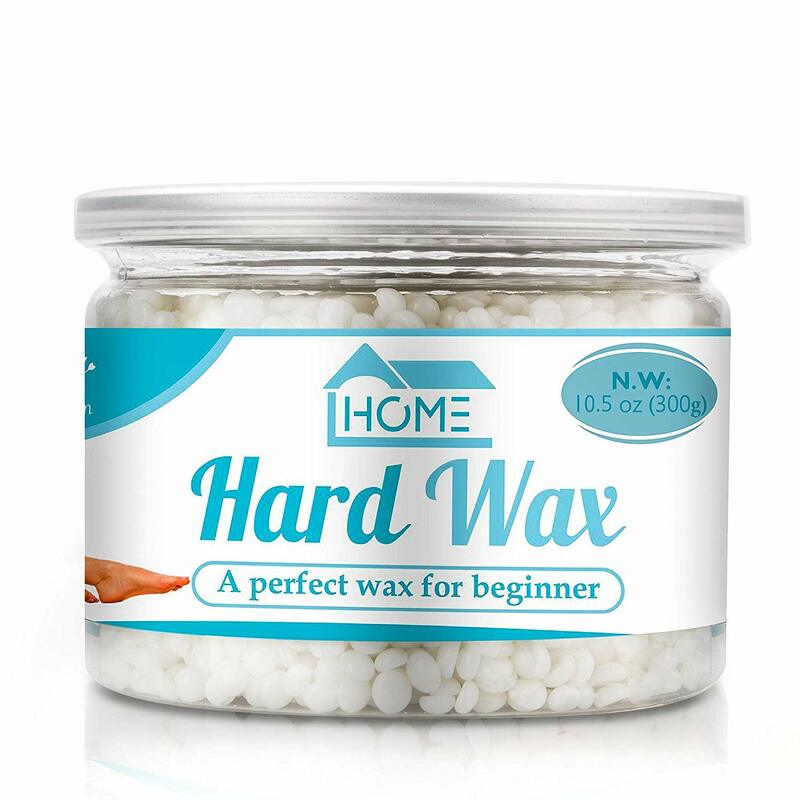 Ease Of use: Make sure that the hard wax beans are easy to melt and apply. It should be able to remove unwanted hair in just a single strip. Scent: The scent matters because it will leave a lasting fragrance on your skin. Look for natural scents, like lavender and chamomile, because they can be therapeutic at the same time. Hard wax beans are a painless alternative to hair removal. The results last longer than shaving. They’re easy and safe to use even to sensitive parts of the body. The hard wax beans we reviewed above are great options for your waxing needs. But if we have to pick the best choice, we recommend the Femiro Hard Wax Beans. They can be used to all parts of the body and you don’t need to wax on the same area twice. The lavender scent is very pleasant. The beans are made of natural ingredients making them safe to use even to sensitive skin. Best of all, you can get your money back if you’re not happy with the results. If painless waxing and long-lasting results are what you need, then that’s precisely what you get.